Barbara Ross is a life long resident of Southeast Missouri who finds inspiration for art in everyday surroundings and has even asked strangers to pose for a photo which she turns into watercolor paintings. She discovered painting at an early age and was trained locally by a regional college art teacher. 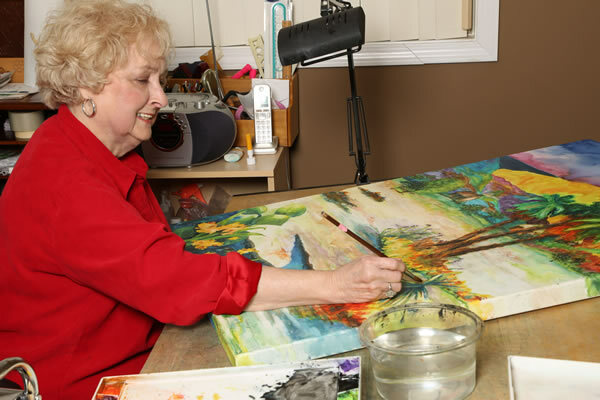 After working in various medium with little success she found her passion and skill in watercolor. She enjoys the amazing use of color and depth in the paintings of artist Paul Jackson and goes on to describe the work of Mary Whyte’s portraits of the South as full of warmth and feeling. Barbara says that another favorite artist, Janet Whittle, paints flowers that are soft, brilliant and dynamic, while Jean Haines’ compositions are loose and full of life. Barbara’s unique character and love of color comes through in her artwork. When she isn’t painting you’ll find her driving fast cars and having fun with her many wonderful friends. She is a compassionate, family-oriented woman whose Christian faith is an important and apparent part of her life. The Southeast Missouri native has varied and unique interests and is happily married. Her eyes twinkle when she says that she is a (sometimes) loving wife of 57 years.